Rubber Room Ramblings: PLEASE DON'T MISS OUT! I know everyone loves to save some money, so, let's do this!! 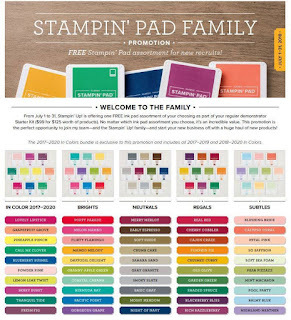 The best deal of all is ten FREE ink pads, in yummy new colors AND the new ink pad style. Here's the deal, when you join Stampin' Up! 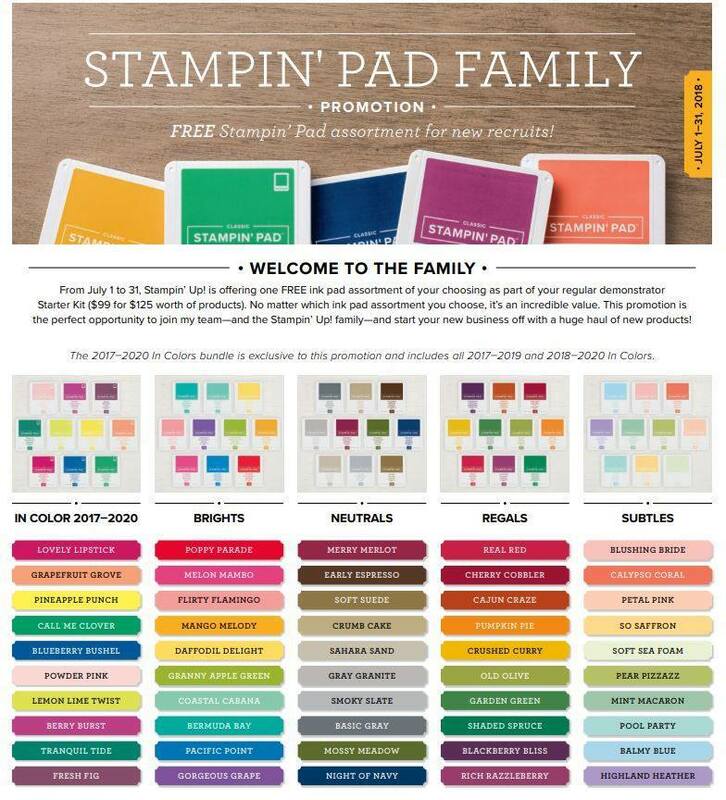 as a demonstrator in July you get $125 worth of product for $99, (and your order ships for FREE) and then you get 10 FREE INK PADS! That's right you can pick $125 worth of product from the new catalog for only $99 and then add ten FREE ink pads to your Starter Kit, making your Starter Kit totally customizable AND worth $192.50. You have absolutely no obligation to ever make another purchase as a Demonstrator, BUT, if you want to enjoy a 20-25% discount as a Demonstrator, and all the other awesome perks we get, you surely can! I also offer special perks when you join my team!! The second special continues the FREE theme: purchase three packs of DSP and get one pack FREE. 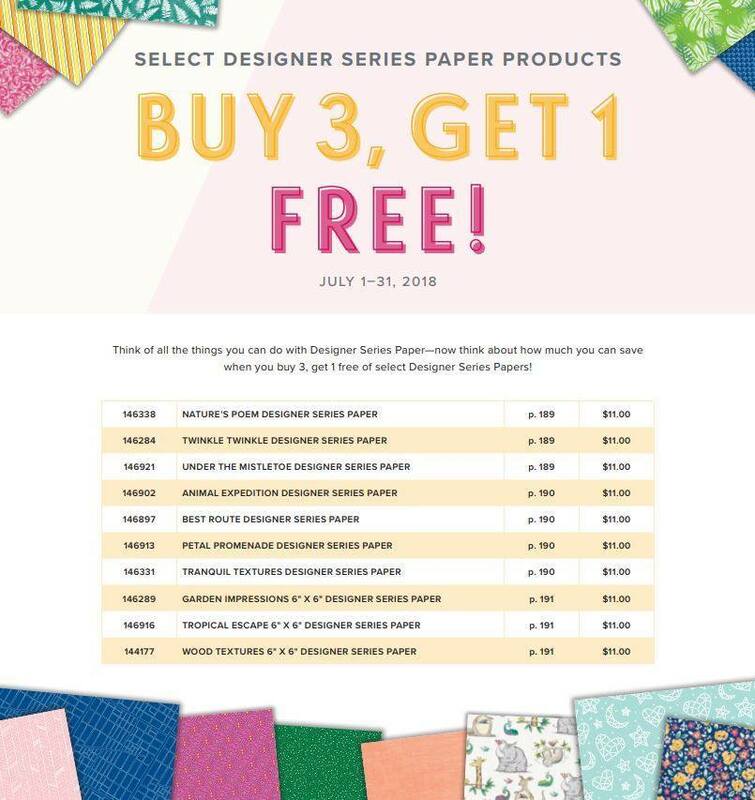 That is such an amazing deal AND right now all of the Designer Series Paper is new. That's right, the new 2018-2019 SU! 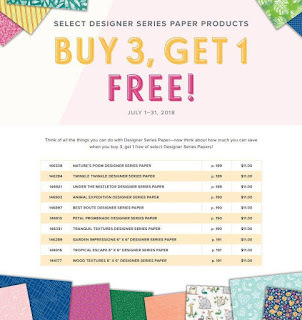 Annual Catalog was revealed in June and it is full of wonderful new Designer Series Paper you are going to fall in love with. Take advantage of this sale and treat yourself to the wonderful world of lush colors and textures Stampin' Up! brings to life by way of paper! AND since I am just arriving home from the most amazing trip, the Stampin' Up! Alaskan Cruise incentive trip, I have a special I am offering as a thank you to everyone who helped me earn that trip,and it to is customizable. Youcan pick either of these specials: Place a minimum $30 order, and receive a tutorial for four gorgeous cards! Or place a minimum $50 order, and receive the tutorial for all four gorgeous cards, PLUS a pack of colored doilies. NOTE: You can combine this special with the DSP special or the Recruiting special. After all, we all love a DOUBLE DIP OF FREE; DON'T WE!! Summer is heating up in the Rubber Room and at Stampin' Up!, my friends! Let's jump on those FREE offers before they disappear!